Now that I’ve introduced everyone to Learning With Text, I thought I would provide a quick set-up tutorial in case you want to get started. Go to http://www.fluentin3months.com/lwt/ and register a username and password. Note: you can set this up another way, but this is the quickest. If you want the program on your computer; go to http://lwt.sourceforge.net/#installwin for Windows or http://lwt.sourceforge.net/#installmac for Mac. Copy and paste the following text into those fields. Now you’re all set up. Step 6: Start adding text and start reading. 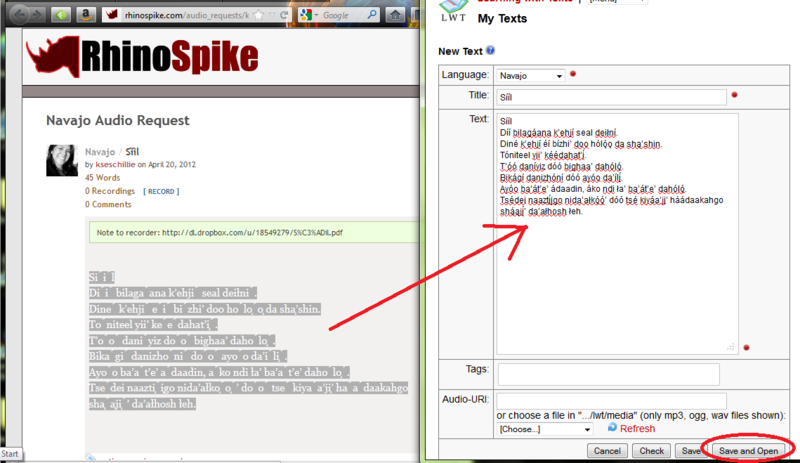 From the drop-down Menu, select Texts. 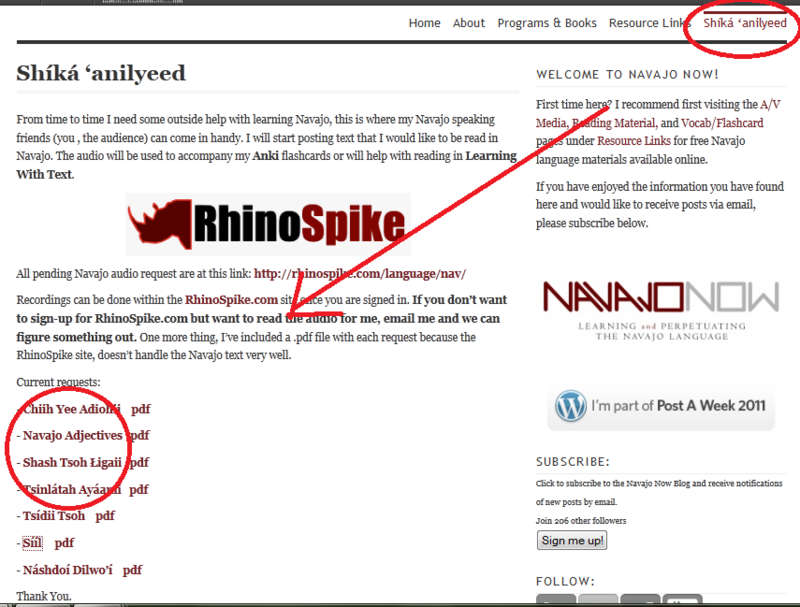 If you are really eager to start you can open another window, go to my RhinoSpike.com requests and copy and paste a Navajo story from there. There is more text available to read via Diné College Multimedia or UNM Digital Library, but you will have to type out everything. Step 9: Enjoy. Let me know if you have any questions. Ok, I got as far as this. : ) But, when I copy and pasted a story, it still comes out “jumbled”. 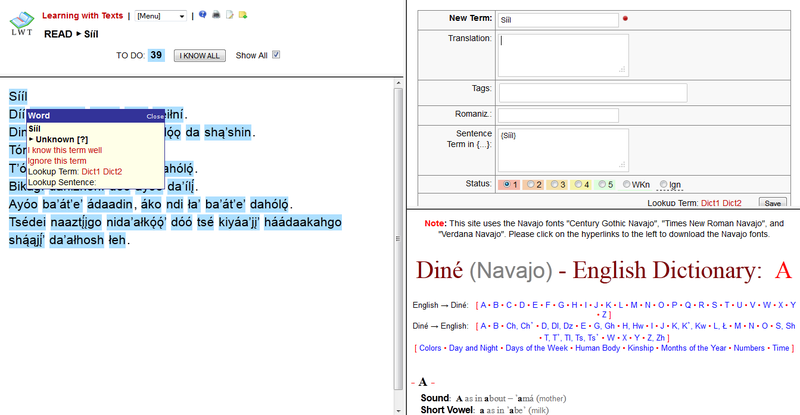 I downloaded on Lapahie.com, the Times New Roman in Navajo font, but it still comes out “jumbled” when I paste it on LWT. Help! Don’t change any of the fonts at the top, just see if that fixes the problem. Let me know what happens. 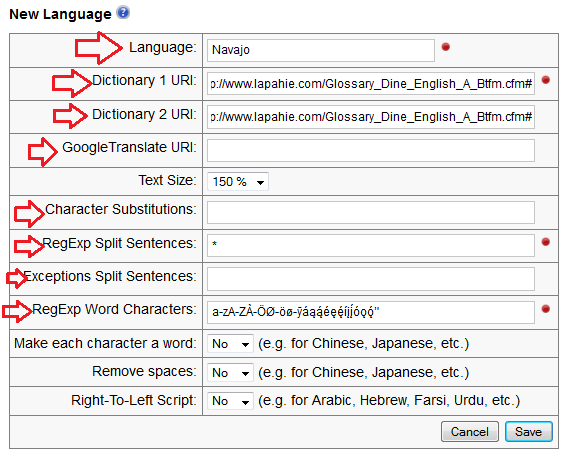 If by chance the problem is that you need to convert the text from a Navajo font to as if it were typed by the Navajo keyboard…I’ve started a blog entry on how to convert the text manually without having much trouble. I guess no better time than today to finish it. Let me know how everything goes. 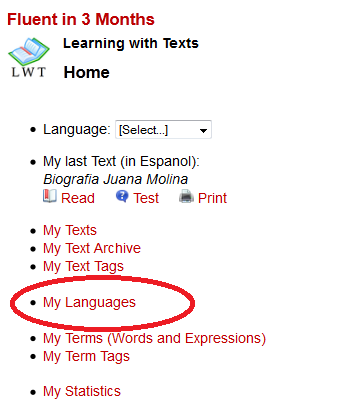 Learning With Text is a wonderful program, so I hope you get to use it without any issues. i was just wondering this program has spanish and navajo, but what other languages does it have? If you go the sourceforge.net page there is a list of blog reviews by other people and their setup in German, Japanese, hebrew.